September 21, 2018 | Diego Castro, an intern at Eden Housing in Hayward, CA. Part of the Non-Profit Housing Association’s (NPH) Bay Area Housing inaugural Internship Program, in San Francisco. “Being able to finish high school, attend college, almost graduate college — all of this is possible because I had a place to go home to every night. It really does start with a home, and everybody deserves that chance to have a place where, at the end of the day, they can go and feel safe.” — Diego Castro, 22, intern at Eden Housing in Hayward, CA. 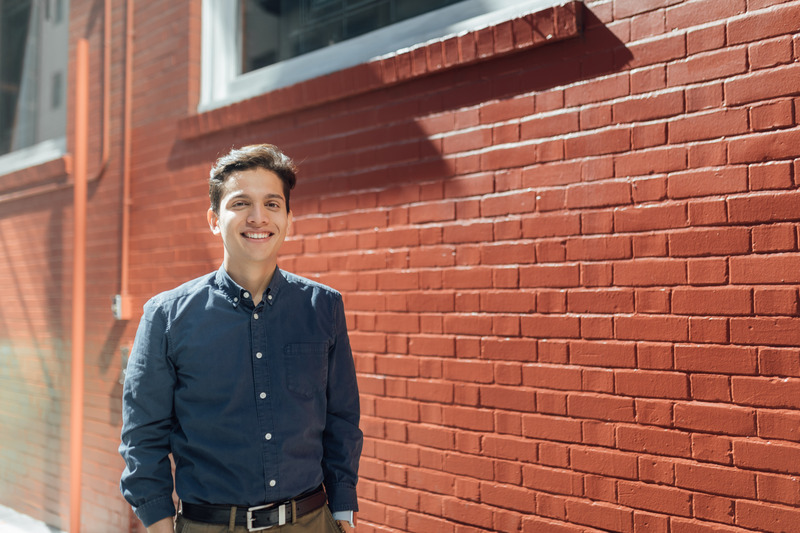 Diego is one of twelve students that make up the inaugural cohort of the Non-Profit Housing Association of Northern California’s (NPH) Bay Area Housing Internship Program. 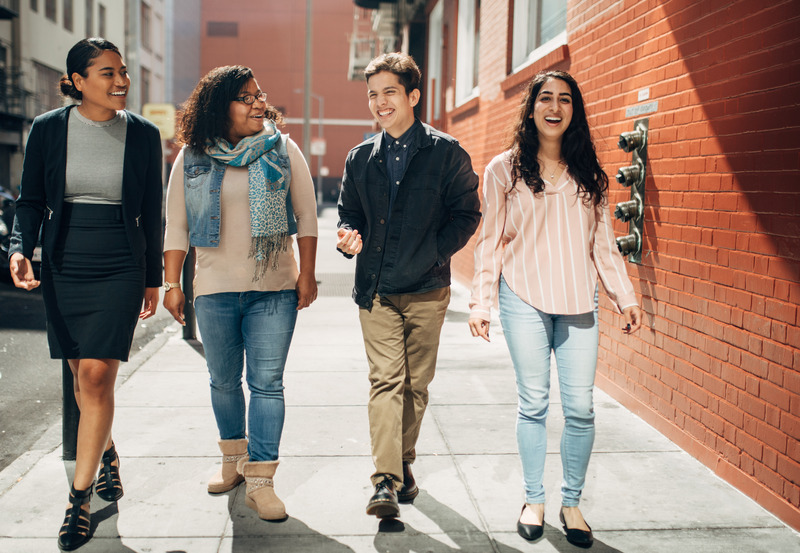 NPH — a membership organization that supports affordable housing developers, advocates, community leaders, and businesses to make the Bay Area a place where everyone has an affordable and stable home — launched the internship program in the Spring of 2018. It exists to “increase the diversity, equity, and inclusion in our field so that our industry better reflects the communities we serve and nurtures the next generation of affordable housing development professionals.” With support from the Chan Zuckerberg Initiative, NPH recruited the cohort — all current college students in the Bay Area — for a one-year, paid internship placement with a local affordable housing organization. September 21, 2018 | Leafaitulagi (Lagi) Tevaseu, LaJanee Turner, Diego Castro, and Hermandeep Kaur, interns from the Non-Profit Housing Association’s (NPH) Bay Area Housing inaugural Internship Program, in San Francisco. Due in part to the affordable housing challenge in California, industry leaders are finding it more and more difficult to recruit and retain housing development staff. This internship program works to create a clear pipeline into the affordable housing project management field for young people of color, immigrants, first-generation university students, and others who come from low-income communities and who demonstrate a commitment to improving the quality of life for marginalized families in the Bay. “Housing affordability matters because nobody should have to choose between paying their rent and buying things they need to survive,” added Leafaitulagi (Lagi) Tevaseu, intern with First Community Housing in San Jose. 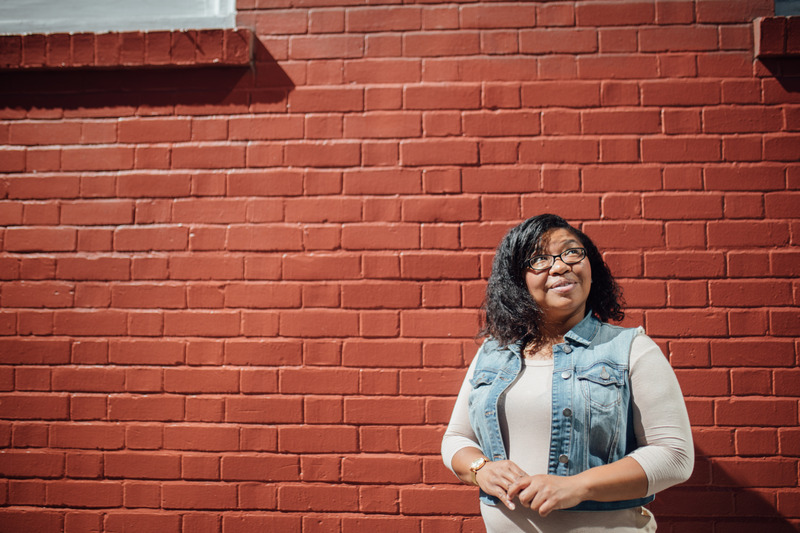 September 21, 2018 | LaJanee Turner, an intern from the Non-Profit Housing Association’s (NPH) Bay Area Housing inaugural Internship Program, in San Francisco. According to McKinsey & Company’s 2016 California housing affordability report, California is ranked 49th out of 50 U.S. states for housing support. It’s estimated that the state will need to build around 3.5 million housing units by 2025 in order to meet demand. In the Bay Area specifically, a household with two minimum wage earners can only afford to live in 5 percent of neighborhoods. As year one of the internship program progresses, NPH has opened Host Agency applications for 2019-20. If you are a current member of NPH and are interested in hosting interns next year, please apply by December 21st at 5pm PST. Founded by Dr. Priscilla Chan and Mark Zuckerberg in 2015, the Chan Zuckerberg Initiative (CZI) is a new kind of philanthropy that’s leveraging technology to help solve some of the world’s toughest challenges – from eradicating disease, to improving education, to reforming the criminal justice system. Across three core Initiative focus areas of Science, Education, and Justice & Opportunity, we’re pairing engineering with grantmaking, impact investing, policy, and advocacy to help build an inclusive, just, and healthy future for everyone. Core to this work is the belief that access to safe, affordable, and accessible housing is essential to community stability and shared prosperity. CZI has partnered with numerous organizations working on innovative solutions in the housing sector, such as: the Terner Center for Housing Innovation, Landed, TechEquity, Eviction Lab, and the Kelsey. CZI has also supported work around ballot measures related to housing, like Prop 1 & 2 in California.